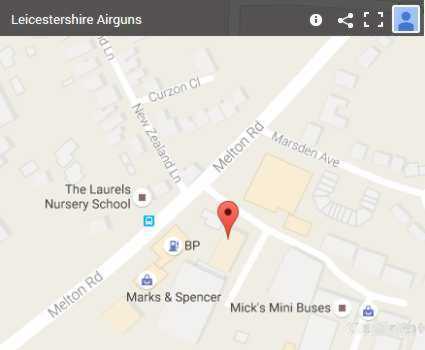 Looking for air gun shops in Leicestershire? Air rifles, air pistols and airgun accessories for sale in Leicestershire. Air Arms, Brocock, BSA, Cometa, Crosman, Daystate, FX airguns, Gamo, Hammerli, Kral, SMK, Umarex, Walther, Webley and Weihrauch. Thursday 10:00 am until 4:00 pm. Friday 10:00 am until 6:00 pm. Saturday. 10:00 am until 4:00 pm. Please e-mail us here or call 07719787079 with your requirements. Leicestershire Airguns is a small, friendly, family run air gun business based in Leicester. Estabilished in 1999, originally based in the cattle market in Melton Mowbray and now at a larger shop in Queniborough we supply a wide range of new and second hand air guns. We are one of the few expanding Leicester airgun shops and now have a new shop in Queniborough. Open Thursdays 10:00 am. until 4:00 pm. Fridays 10:00 am. until 6:00 pm. and Saturdays 10:00 am. until 4:00 pm. Top brand airguns for sale in store or to order. Air rifles and air pistols for sale in leicestershire - order online at Leicestershire Airguns and have your new air gun delivered to your door. We are one of the few remaining airgun shops in Leicestershire. We carry a wide range of junior air guns and full power air rifle packages suitable for pest control. Used airguns wanted, part exchange or brought for cash. Please bring some ID with you for a cash payment on secondhand air guns. So if you are looking for an airgun shop in Leicester just give us a try, you will be pleased you did. Our airgun delivery service covers the whole of Leicestershire including Kibworth, Mountsorrel, Loughborough, Broughton Astley, Market Harborough, Coalville and Shepshed. Air rifle shop Leicester. Looking for cheap air rifles on Amazon or ebay? Amazon UK do not allow air guns for sale. E-bay have not allowed air rifles and air pistols sales for over 15 years now. If you are looking for the cheapest air rifles the best place is Leicestershire Airguns. Looking for Airsoft? Try Leicestershire Airsoft. Well stocked with a good selection of airsoft guns and accessories. Field Sport UK Field Sport Activity Centre, Melbourne Road, Lount, Leicestershire, LE65 1RS. Air rifles for sale in Leicestershire. Air rifle pellets in Leicestershire. Air rifle targets for sale in Leicestershire.